Hemel Hempstead Town will be looking for a return to winning ways when they welcome Concord Rangers to Vauxhall Road on Saturday. The Tudors suffered injury time heartbreak at Dartford last weekend as they were pegged back in a 2-2 draw -–having played for 40 minutes with 10 men following a controversial red card for defender Ed Oshodi. 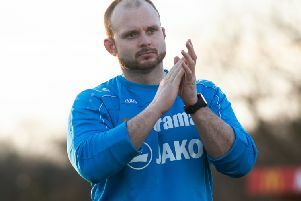 But Tudors boss Brennan is urging his side to respond in positive fashion as they take on struggling Concord, who sit 18th in the National League South table after losing seven of their last 10 league games. “It’s another tough game because they’re going to be needing the points just as much as we are,” said Brennan. “There has been a lot of change at that football club after their long-standing manager left, and that takes time to adapt to. We look forward to every game at this level – Concord are a bit like us, they are underdogs but the will be fighting for their lives. Hemel have had a steady start to the season and currently occupy eighth place in the table, but Brennan knows that his side can’t afford to take Concord lightly. “We look forward to every game at this level – Concord are a bit like us, they are underdogs but the will be fighting for their lives,” he said. “They have got a good manager and they are not a bad side - I remember when we beat them at their place earlier in the season, they had a fantastic chance when it was 0-0 but goals change games. He added: “I know that no game is the same, but a repeat performance from Saturday will help us to go in the right direction.